Our expertise and focus is on the archaeology of the East Midlands, with our staff possessing a large amount of archaeological experience in this region. We believe the best way to make real advances in the overall understanding of an area is to specialise in that area; and to try to maintain a continuity of knowledge and experience in the staff working in that area. Such a commitment allows Mercian Archaeological Services CIC to set a number of long term research goals which could not be addressed within the scope of a single project. Currently, understanding the post-Roman ceramic sequence and understanding medieval settlement and landscape development within our area of interest are paramount amongst these goals. We are also at the fore-front of research into the Archaeology of Sherwood Forest, and run the Sherwood Forest Archaeology Project. We also have expertise in post excavation analysis, particularly finds processing and analysis. 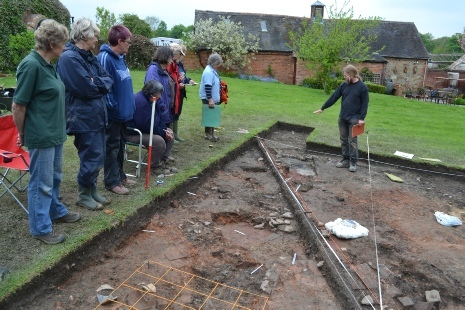 Mercian Archaeological Services CIC is an Affiliate Member of the Council for British Archaeology. We undertake to abide by all relevant professional archaeological codes of practice and standards and guidance, including those of the IFA and English Heritage. We are committed to the full dissemination of the results of all our work, and to the lodging of the information with the relevant repositories. Full publication of our work is essential and we consider it a priority to publish everything promptly; both for an academic audience but also in more accessible formats such as the Internet, magazines, leaflets, and newspaper articles in order to ensure the widest possible dissemination. Mercian never undertake archaeological works without reporting to the required levels, and believe that reporting is a fundamental requirement of the profession. Reports are one of the ways in which a company’s ethos and professionalism can be judged and Mercian always strive to produce reports of the highest standard in order to meet our aim of producing quality research. Mercian publish interims of all their work annually in the Transactions of the Thoroton Society Short Reports. Reports for clients are published promptly in line with contractual agreements for delivery. For long term self funded research projects; such ongoing research projects at King John’s Palace in Sherwood Forest http://www.mercian-as.co.uk/kjp_sfap.html - interims are published in the annual Transactions of the Thoroton Society Short Reports, and appear where possible on Mercian’s publication pages. Full reports for long term projects are published at the end of the research projects in line with the standards and guidance of the Institute for Archaeologists. Mercian Archaeological Services CIC are fully insured for all work undertaken; including Public Liability, Employers Liability and Professional Indemnity. Staff are qualified Emergency First Aid at Work Certificate holders. A community interest company (CIC) is a new type of company introduced by the United Kingdom government in 2005 under the Companies (Audit, Investigations and Community Enterprise) Act 2004, designed for social enterprises that want to use their profits and assets for the public good. Community Interest Companies (known as C.I.C.’s) are one of the fastest growing community oriented enterprise movements in the country. Roughly 1 in every 200 new companies last year was a CIC, and as of August 2014 there are almost 10,000 CICs on the Regulators register. CICs can vary from small ‘kitchen table’ type organisations, to multimillion pound turnover organisations employing thousands of people. They can be set up as both Company Limited by Guarantee and Company Limited by Shares, and are often described as Mutuals or Social Enterprise. Co-operatives can hold the status and it is feasible for a CIC to make an IPO and hold PLC status. It also provides individuals with a simple legal structure to engage with their chosen community issue. The CIC legislation was introduced as a legal form under the Companies Act 2006 and subject to that Act and company law generally. - Assets owned by the company are held in an asset lock which secures those assets to applications for the good use of community. Both of these features are regulated by the Community Interest Company Regulator via an annual report, known as the CIC34, which is submitted to the Regulators office on an annual basis. The Community Interest Company Regulator’s office is a part of Companies House and governed by The Department for Business, Innovation and Skill – BIS. Mercian Archaeological Services CIC are a private company, and we operate as a private entity, but we are founded on a community basis. The company and its work is privately owned, but we seek to benefit the community and to provide community opportunities to people in-line with our enrolment as a Community Interest Company. Mercian are not a public body, or a charity, but as a CIC we do have a community aspect that, and our status has been awarded due to the community focus of our work. As a Community Interest Company we re-invest some of the profits we may make to further our mission, particularly to aid project development and provide training opportunities. Mercian Archaeological Services CIC are a Community Archaeology company and as such we seek to involve the community in as many aspects of our work as possible. It is also to conduct archaeological research within the East Midlands which provides genuine benefit to local communities; helping them to engage with, explore and understand their heritage. We also provide training and education; developing transferable skills useful across society, and helping personal development and well-being. Projects are designed to foster relationships within and between communities. We believe it is critical that our research benefits the wider archaeological community. We therefore seek to undertake projects that address key research questions highlighted as priorities by the regional and national archaeological community. Our work is driven by a strong focus towards involving volunteers from local communities at all stages (where appropriate) of the work; and sharing our knowledge with them. Our staff have many years of professional archaeological experience undertaking, supervising and directing Community Archaeology projects. Mercian are a company of archaeologists who specialise in the archaeology of the region, providing the excellent knowledge and skills to our customers. We are a Community Interest Company who provide archaeological services and specialise in Community Archaeology, Public Involvement, Training and Research. Our mission is to create a new way of undertaking sustainable archaeological research in the 21st century. Please note - we will only store your name and email address and will not share that information with anyone else. This statement is to confirm Mercian Archaeological Services CIC’s compliance with the newly enforced data protection legislation under the GDPR which is due to be carried out before 25th May 2018. 3. Physical data in the form of health and safety and onsite data processing forms etc. Mercian holds a mailing list of email addresses, and associated names; consisting only of people who have explicitly confirmed their desire to be on our mailing list will be retained. Mercian store your data in line with GDPR EU regulations, on password protected systems (email account and personal computers) and will only use it for the purpose of sending you information about the services you have entered into with Mercian. Mercian do not pass on data to anyone else under any circumstances other than for legitimate business purposes e.g. accounting (we will ensure any thirds parties are also GDPR compliant), and legal requirements. When Payments for products are made online; Mercian retain details consisting only of name(s), address(es) and email address(es). Mercian hold the above details in line with GDPR EU regulations, on password protected systems (email account and personal computers). Hardcopy sign-in sheets (which includes consent for use of photographs) and risk assessment sign-off sheets are kept indefinitely. These documents are kept locked in a filing cabinet. Should the company be dissolved; these documents will be destroyed after seven years. Client medical/health details are stored on hardcopy paper sheets and are kept only for the duration of fieldwork, for use in the event of an emergency on site. These paper documents are kept with the relevant member of staff at all times on site or in a locked filing cabinet where there are site facilities. These documents are not seen by any other party (except for the relevant emergency services at the point of contact). These documents are destroyed securely at the end of fieldwork. Mercian Archaeological Services CIC is a Private Company Limited by Guarantee. Mercian is founded on a community focused ethos and entirely the property of its Directors. We are based in Sherwood Forest, Nottinghamshire. We also have offices in Nottingham, Derby and Lincoln.